Grilling is a delicious and easy way to quickly cook fish without adding more than a tiny bit of extra fat! In France, this is often greatly improved by adding herbs to the side of fish that is being grilled while you are cooking the fish. In other words, you actually grill the herbs along with the fish. If you want to grill indoors (and dont have an indoor BBQ) all you have to do is use a stove-top grill . This method can be used with a whole gutted fish or a fillet. It is best to leave the skin on your fish for this cooking method as it will protect the fragile flesh from breaking up during the cooking process. Salt the fish (and pepper it, if you wish). If you want, you can make small diagonal slits in the skin to allow it to get more crispy while cooking and also to let in any other flavors you may want to add while preparing or cooking. The bigger the piece of fish, the lower the heat but you still need to grill the fish quickly at a high heat so only turn it down a bit. If you have a skinless filet and you only have a grill on which to cook it, I recommend that you grill it on top of a lightly oiled piece of parchment paper. You need to keep an eye on your fish and turn the heat down if necessary. Fish is almost translucent when raw and looses its translucence (becomes opaque) the instant that it is done. This is the exact moment to serve, as fish becomes rubbery very easily when over-cooked. Serve fish on a warm plate. You can serve fish with olive oil and also with freshly squeezed lemon. You can also serve fish with a sauce. 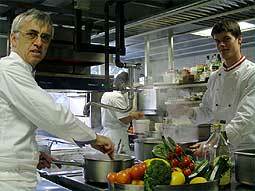 This article comes from French Chef Jean-Louis Vosgien. Jean-Louis Vosgien is a culinary consulting chef. He was the first chef in France, in the 1980's, to introduce fusion food which at the time was unknown, and he is considered an expert in that field by the press. He created two cookery schools, one in Saint-Tropez and the second in Lorgues, near Saint-Tropez. He is also renowned in France for creating created a cake known as Le Canelou de Provence which is sold today in the three major supermarket chains in France. He was also involved in the creation of the French cookery book La Cuisine de Mistral", with Alain Gerard and Robert Callier.